It just keeps on getting better and better for Brexiteers. TNS has released the results of its latest online poll and it indicates a seven-point lead for the Leave campaign (47/40%). Leave’s winning margin has increased by five points since TNS’ last poll which was published last week. This makes it yet another piece of research that proves that a pro-Brexit swing is definitely happening. 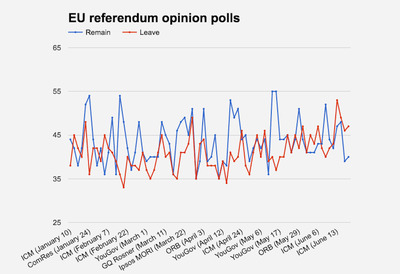 Last night, polls published by YouGov, ORB, and ICM all gave leads to the Leave campaign. This was hugely significant as it meant that the campaign for Britain to pull out of the 28-nation bloc had sustained its lead in polls conducted both online and over the phone. This TNS poll — which surveyed 2,497 Brits — will only add to the Leave campaign’s growing confidence with less than two weeks to go until the June 23 referendum. This is how the TNS poll affected Business Insider’s live opinion polls chart. 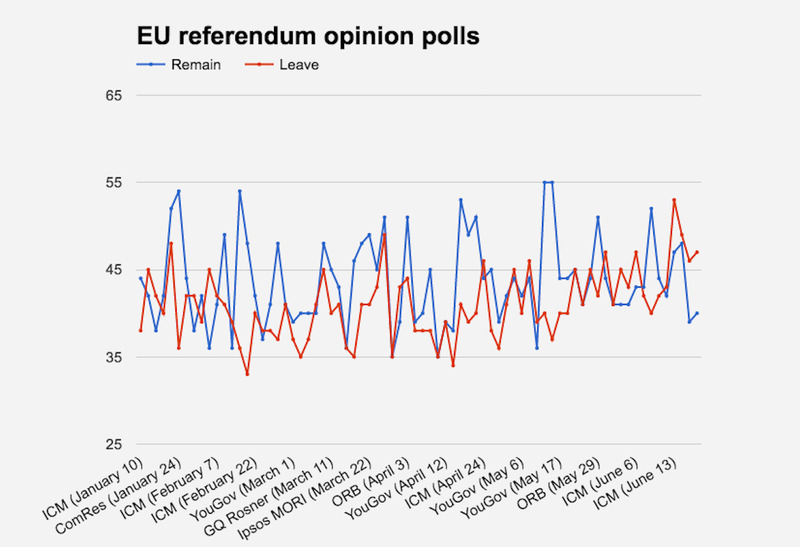 All the momentum is with the Leave campaign right now — as the chart illustrates, its support has grown steadily and consistently since mid-May. The poll comes on the same day that British tabloid newspaper The Sun officially endorsed the campaign for Britain to leave the 28-nation bloc. Polling analysts like Matt Singh and bookmakers maintain that Britain voting to remain in the EU is still the most likely outcome, however, at the moment, the chances of a Brexit actually happening are improving with each day that passes. Last week, Singh’s referendum forecast model indicated that the probability of Britons voting to leave the 28-nation bloc on June 23 was 24%. This has jumped to 33% since then.